Rescue Runts from Bandai are unloved little puppy dogs which need a new home and lots of care to make their character shine. 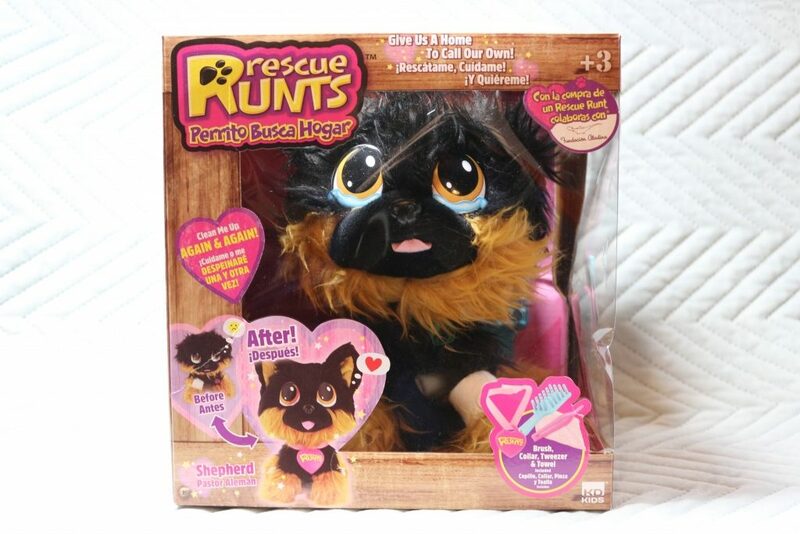 Rescue Runts are fairly similar to Scruff-a-Luvs which I met and loved at Dream Toys. Both toys offer a transformation when the stray pets are ‘rescued’ and groomed. Rescue Runts have a slightly lower price point of £17.99, and you also know which character you get from the box. Rescue Runts are also more neutral and realistic colours and are all suitable Christmas presents for a girl or boy. 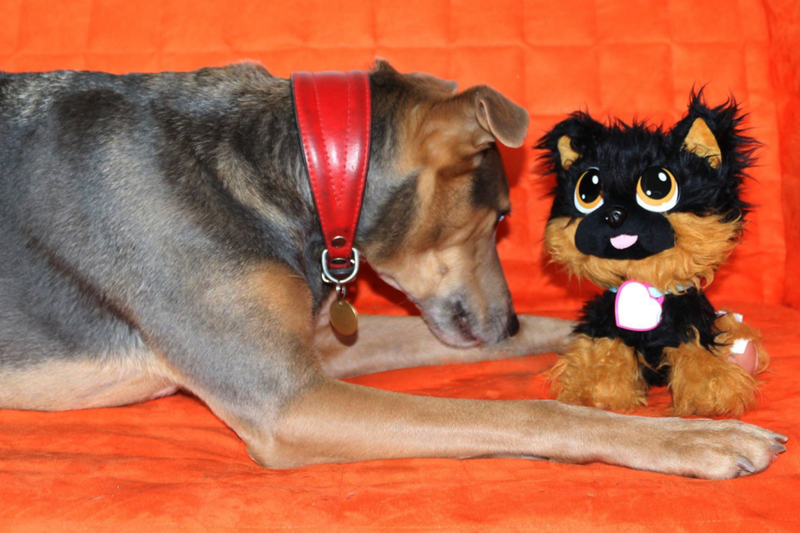 We were sent Shepherd, a brown and black scruffy little Alsatian Rescue Runt for review. There are currently three other puppy Rescue Runts to collect; Husky, Spaniel and Spotty. There’s also a unicorn Rescue Runt! Inside the box, you get your 7-inch plush cuddly dog, and accessories: a hairbrush, tweezers, flannel cloth, and collar. There is a cut-out adoption certificate on the side of the box. You can download a large printable certificate by clicking here. The puppy comes covered in fleas which need to be picked off with tweezers. These are loosely stitched onto the pup and come away easily. Unwrap and remove the bandage on their leg. Again, this is super simple to do. 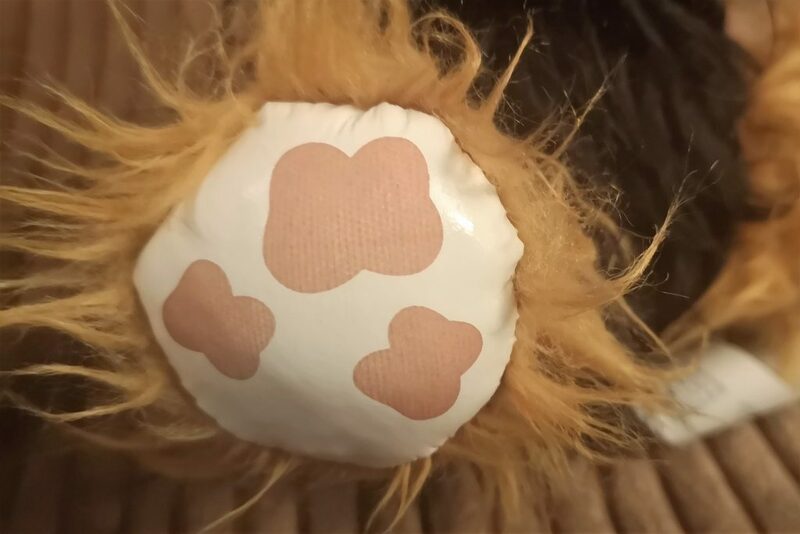 Stretch their ears up (they have wire inside but are flattened in the box) to make them perky and alert, pull their tongue down (again, held up with a loose stitch), and dry their big puppydog eyes by peeling off the tears. Give them a good brushing and they will look like a new pup! The Rescue Runts also come with ‘muddy’ paws which you rub to clean. Lastly, give them a name and write it on their collar. What did we think of our Rescue Runts pup? It didn’t take long to cheer up Shepherd and make him look happier. We couldn’t really get rid of the mud marks completely by rubbing; these come back after time anyway and can be rubbed off again although it’s unlikely you’d be able to make them disappear completely. 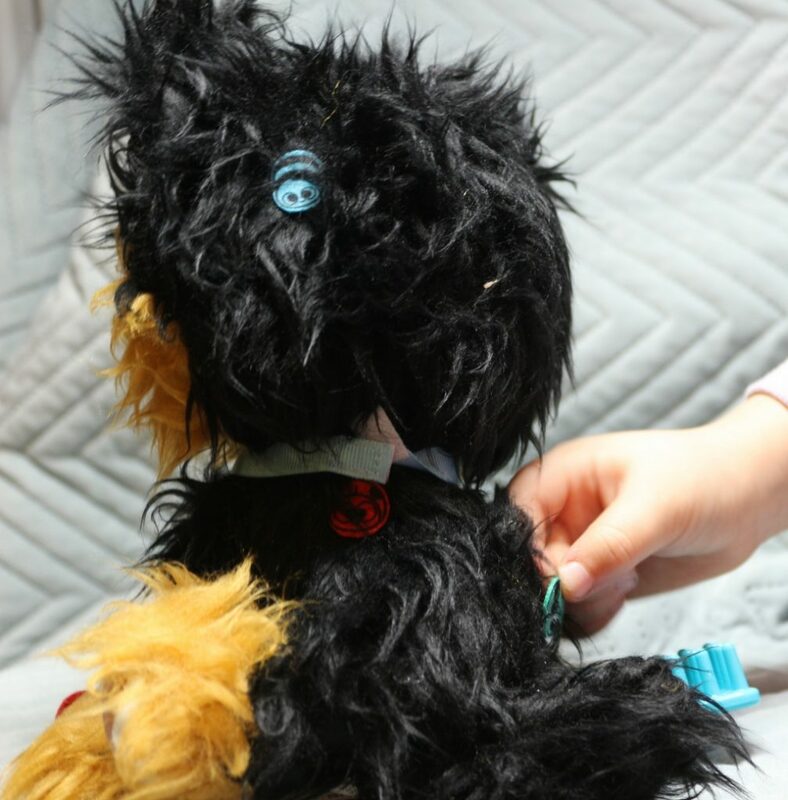 The fur will, like any long-haired plush toy, get messier over time and it will therefore need brushing to keep your Rescue Runt looking good. My only criticism of Rescue Runts really is the name! We have our own rescue dog (you can read aaaaaall about him here) and I don’t think runt is a very nice term. I concede I may be a little over sensitive about this, but I can think of many nicer names! 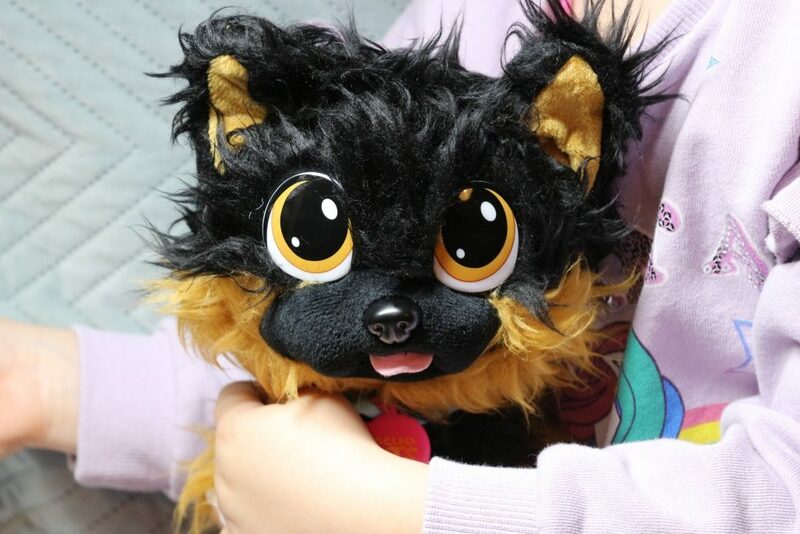 Other than that, it is a cute plush with an added play element and children will enjoy caring for their pups and transforming them from a scruffy rescue to a lovely puppy dog pal. Rescue Runts have an RRP of £17.99 and are available to buy nationwide and from Amazon using the link below. They are suitable for children aged 3+. 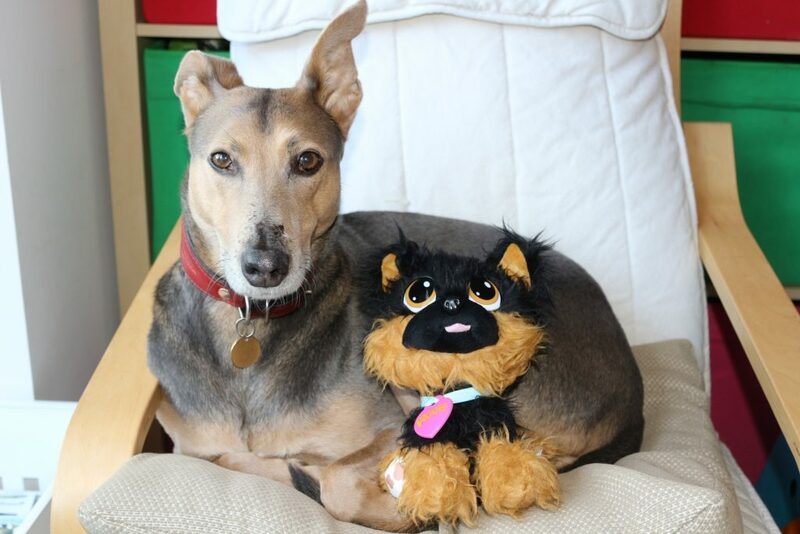 We were sent this product free the purposes of this Rescue Runts review, however I have retained full editorial control and all pictures and words are mine. You can WIN your own Rescue Runts pet below! I absolutely love Shepherd he is super cute! Who couldn’t possibly love him? he is adorable. Our dog-mad 5 year old would love all of these! Especially the Husky. Such a huge animal lover with true empathy for all creatures, especially those needing help. Even a drowned worm she saw on the way out of school yesterday. She was very sad and described worms as cute. And here’s me with a worm phobia! Awww I love them all! My daughter would love the husky…. It would be the closest she would ever get to owning one! Shepard. Which is the one shown on this webpage. My favourite has to be the husky so adorable! My favourite Rescue Runt is Spotty. I love the husky the best! Very cute! Shepherd is the favourite in our household. Thank you for the chance. I can’t make up my mind between Shepherd or Husky. My favourite Rescue Runt is Spotty, though they’re all very cute! I love them all but the husky is my favourite. I love the Shepherd but my son will probably love the Unicorn. All our pets are rescues so I like this idea. My favourite is Spotty. Very cute! A lovely range but my favourite is the adorable Spotty. They’re all lovely but I think my favourite is the husky. i love the Husky, very cute! I love the unicorn personally! I think my little girl would too, although Spotty is also very cute!